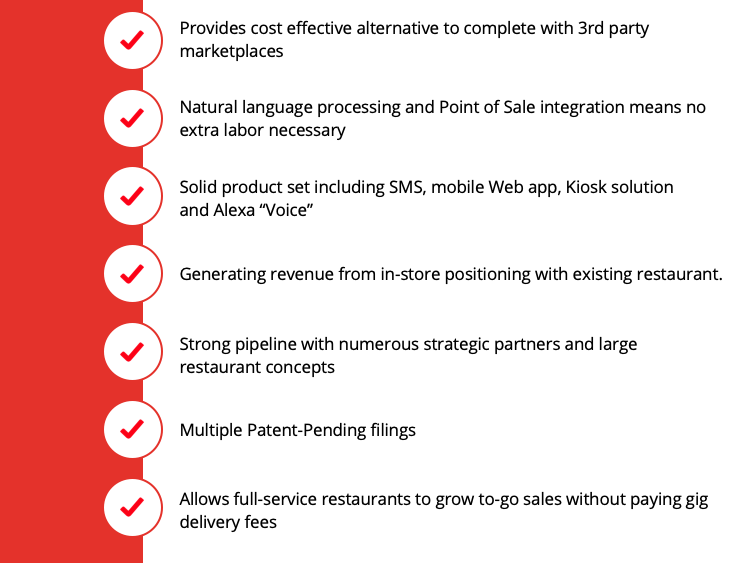 App-free mobile ordering for restaurants powered by AI in the cloud. 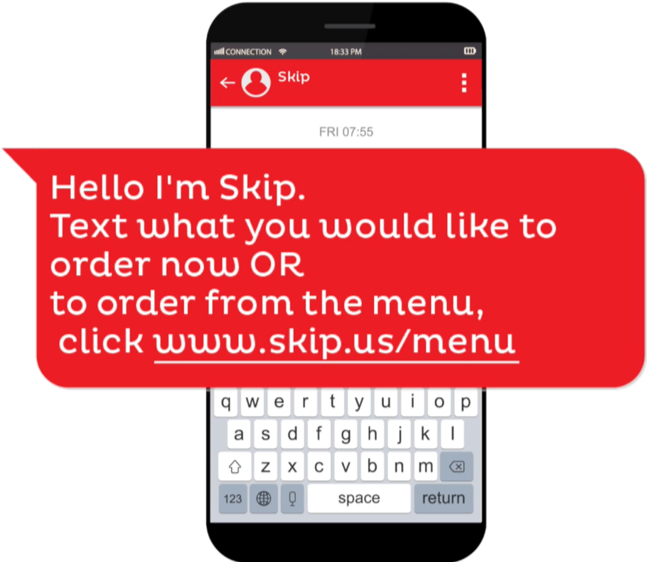 Skip is a disruptive new platform that allows restaurant customers to place their orders directly via SMS, using completely natural language. 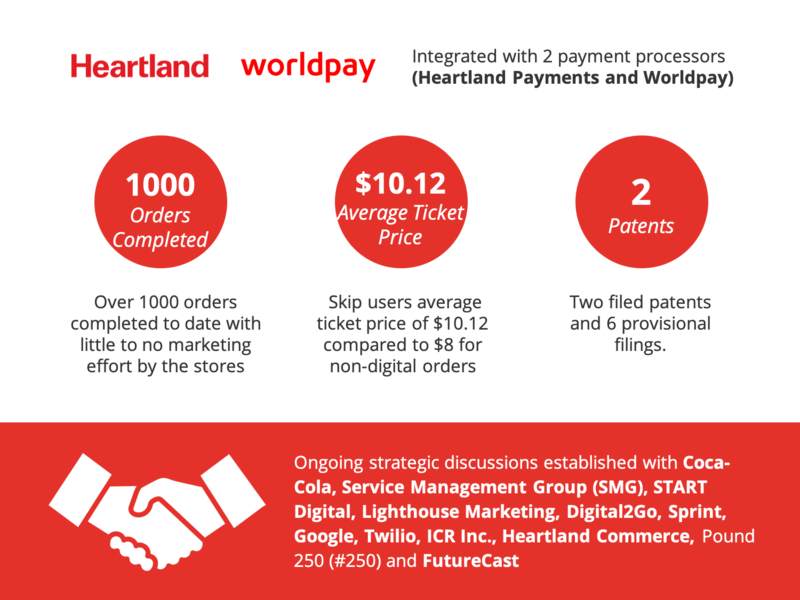 It moves ordering out of the proprietary “app” space into the ubiquitous SMS messaging space. 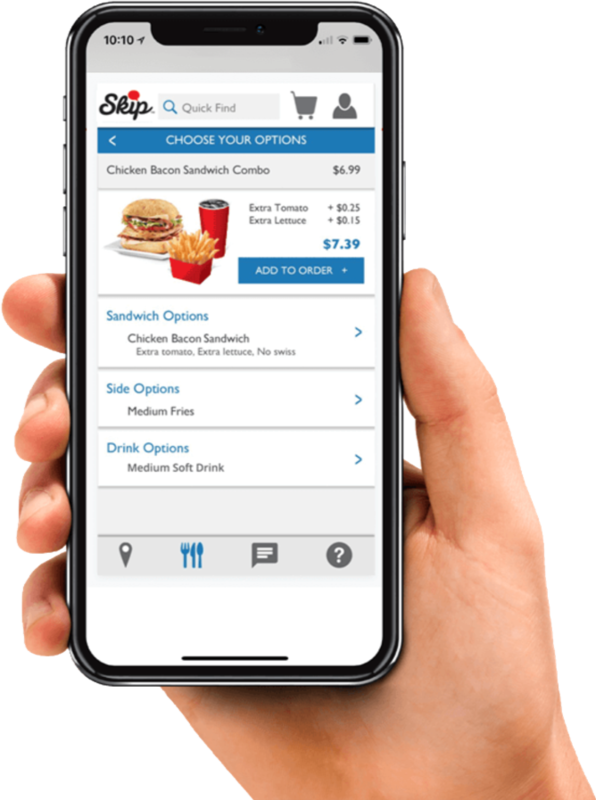 Skip provides customized ordering capabilities utilizing both conversational and app-like commerce through integrated and synchronized text and the mobile web. 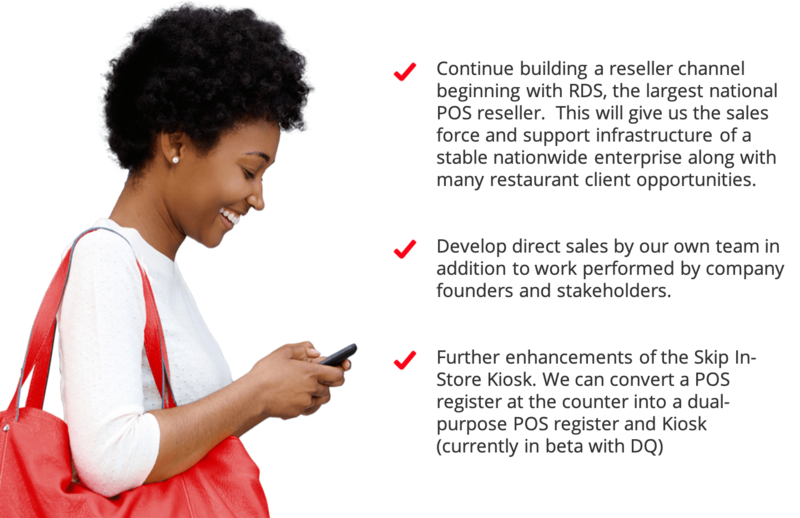 Other ordering options include voice, desktop and other messaging channels. 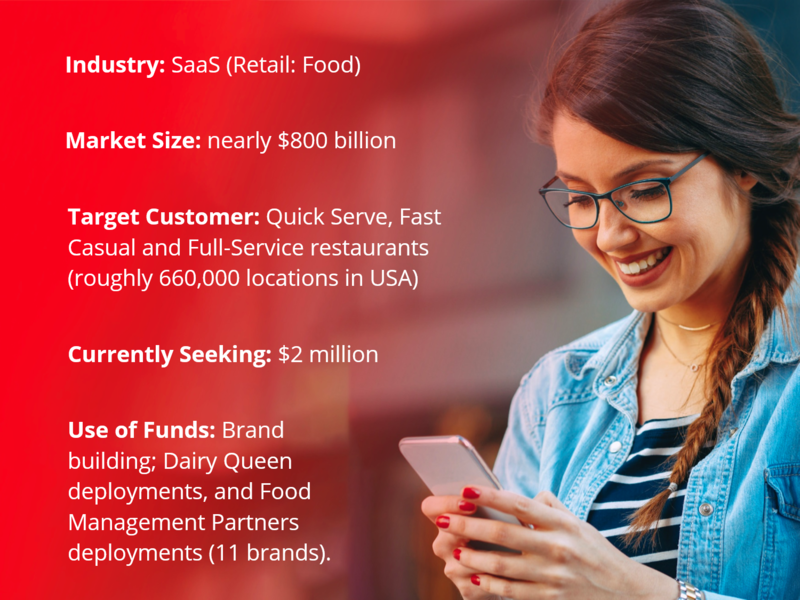 Consumers have shown a distinct preference for messaging as they shop, buy, and communicate which becomes as simple as a few taps in the messaging channels they're already using. 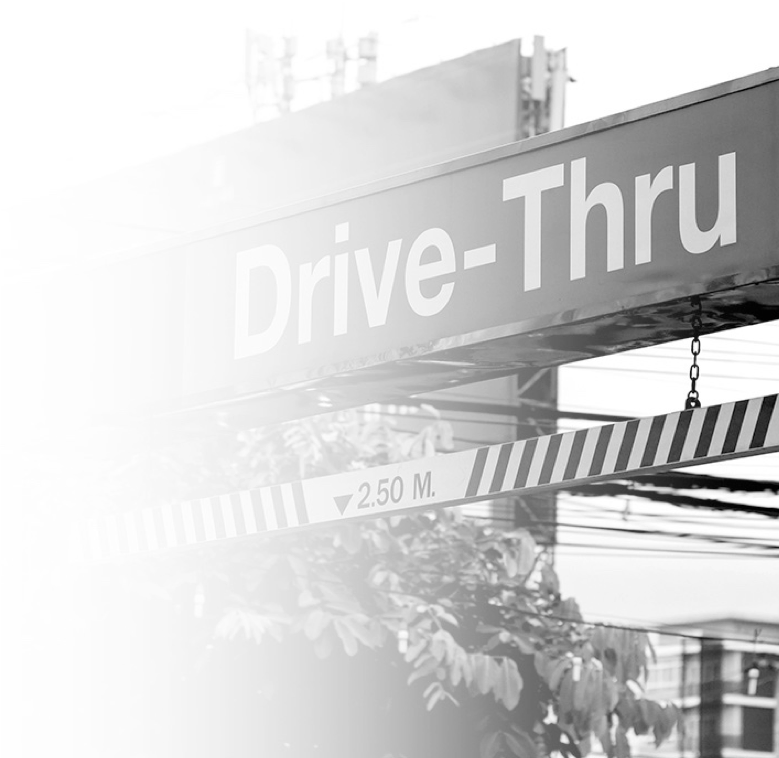 On a stormy night, he attempted to order some food from a Drive-Thru. However, the location of the speaker and the mechanics of his car’s window meant that he couldn’t communicate with the order-taker without hanging his head outside to hear in the pouring rain. 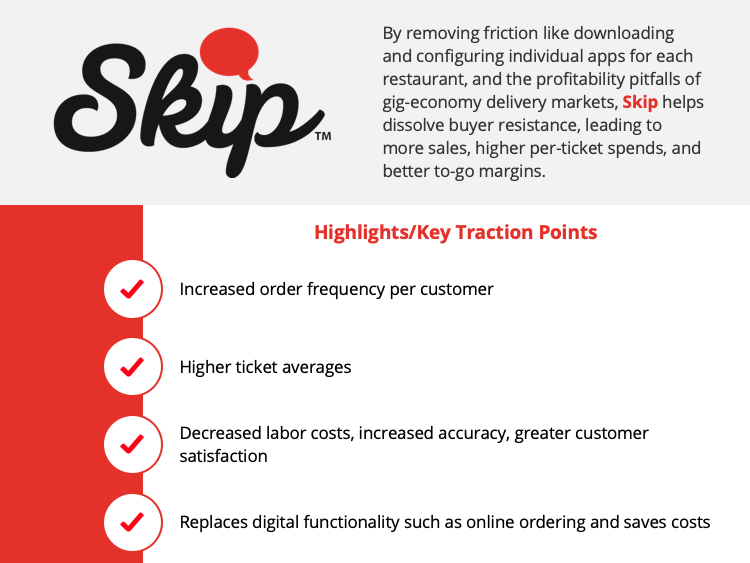 Skip approaches restaurant order automation in a completely new way — by eschewing the app. 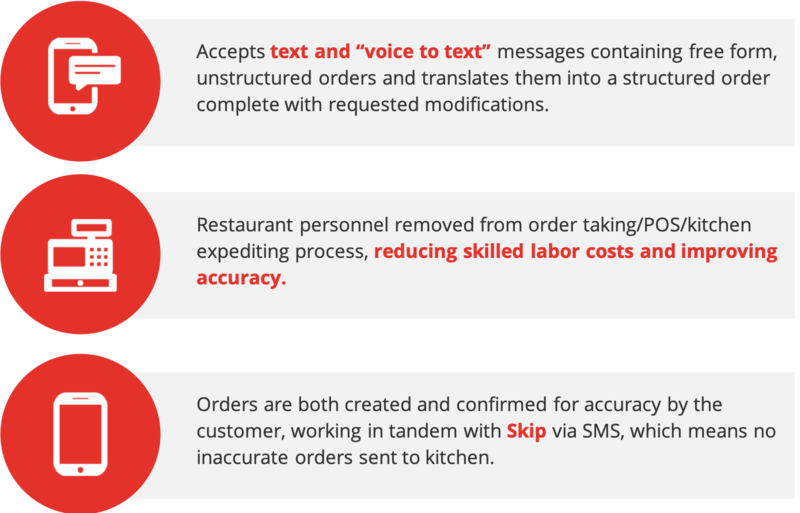 “Apps” have become the de facto manner in which restaurant brands automate their ordering process, but suffer some considerable drawbacks. 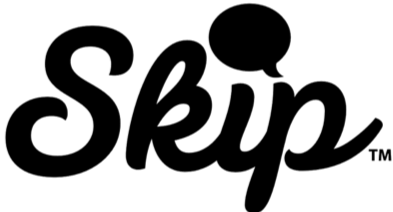 They take up space on users’ phones, and require active installation. 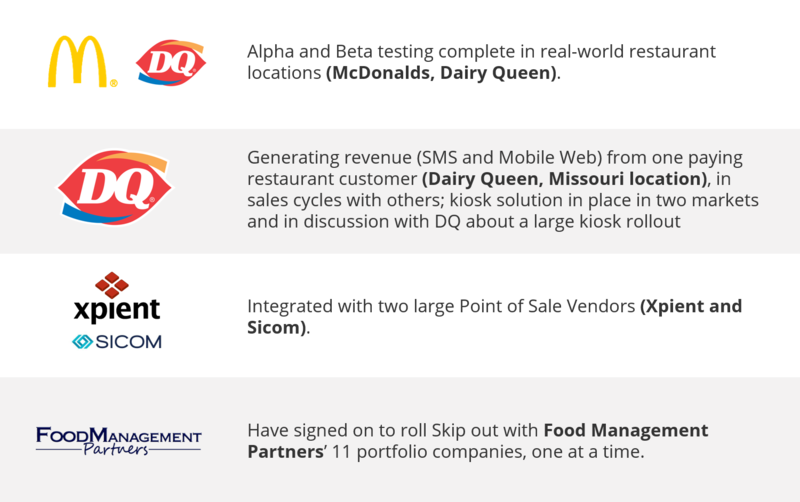 Their UI’s vary, making them difficult to use and navigate the menu. 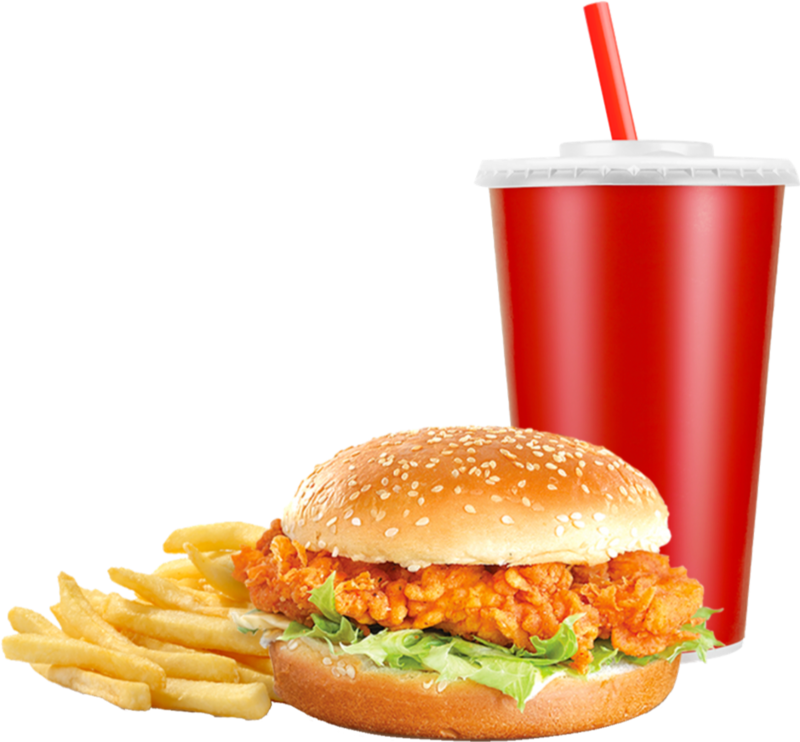 We made ordering immediate. No need to download an application. 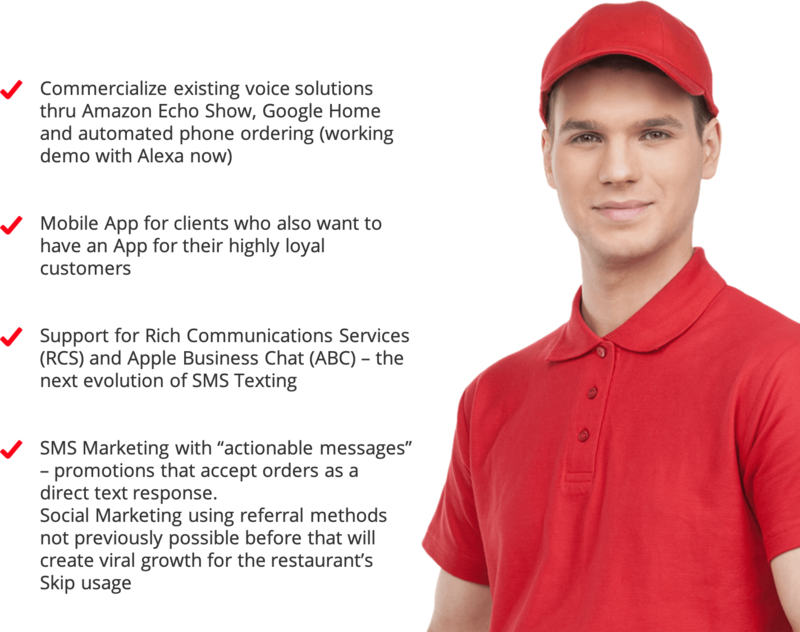 Simply text a Skip restaurant with a regular SMS text message in your own words, with either an order or an inquiry regarding the menu. 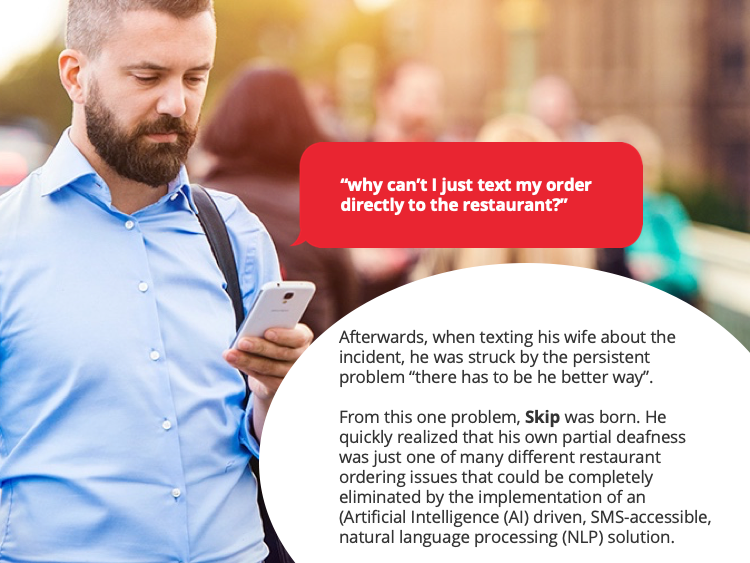 Skip understands, and will respond in kind.